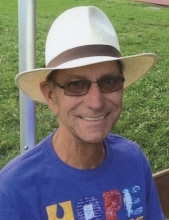 Jeffrey Reinhart, age 59, of Holland, Indiana, passed away Sunday morning, March 24, 2019, at home surrounded by his family. He was born January 13, 1960, in Huntingburg, Indiana, to Russel “Eldo” and Patricia (Frick) Reinhart; and married Karen Hobbs on October 11, 1980. Jeff worked as a coal miner for 20 years with the Peabody Coal Company; was a member of Salem United Church of Christ in Huntingburg and the Holland American Legion; and enjoyed working in his shop, listening to music, collecting and repairing old Victrola record players, and spending time with his dog - Lilly. He was preceded in death by his parents; brother, Kent Reinhart; sister, Sonia Reinhart; nephew, Adam Fischer; and sister-in-law and her husband, Becky (Mark) Rust. He is survived by his wife, Karen Reinhart of Holland; one son and two daughters, Ian (Natalie) Reinhart of Marion, Illinois, Sara (Sean) O’Connell of Brownsburg and Sonya (Steven) Villines of Evansville; eight grandchildren, Jack, Avery, Wesley, Fisher, Benny, Sarah, Vincent and William; one brother and two sisters, Bruce (Rachel) Reinhart of Jasper, Sherry (Doug) Perkins of Fort Pierce, Florida and Sheila (Dan) Fischer of French Lick; his father-in-law and mother-in-law, James and Ollie Hobbs of Huntingburg; sister-in-law, Donna (Dan) Gunselman of Holland; and two brothers-in-law, James (Delana) Hobbs of Ferdinand and Bill Loper of Winter Haven, Florida. Visitation will be held at the Nass & Son Funeral Home in Huntingburg from 5:00-8:00 p.m., on Tuesday, March 26, 2019; and also from 9:00-9:45 a.m., Wednesday, March 27th, prior to proceeding to Fairmount Cemetery in Huntingburg where a 10:00 a.m. service will be held at the graveside. Reverend Mark McDaniel will officiate at the graveside service. "Email Address" would like to share the life celebration of Jeffrey Reinhart. Click on the "link" to go to share a favorite memory or leave a condolence message for the family.